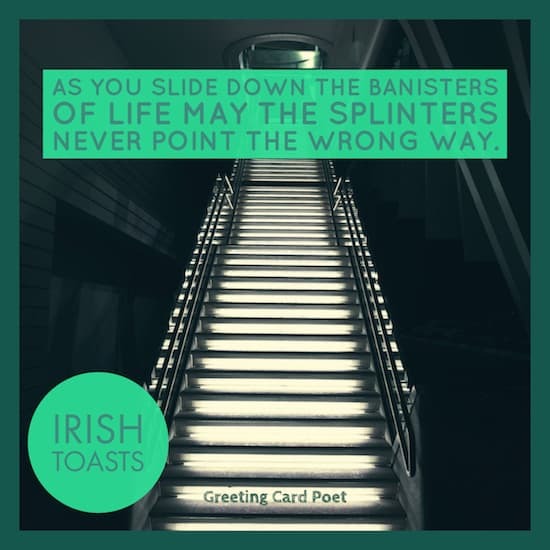 You’re on Irish Toasts, page 5 of 6 Irish Toasts, Blessings, Quotes & Sayings. See menu at bottom of page. 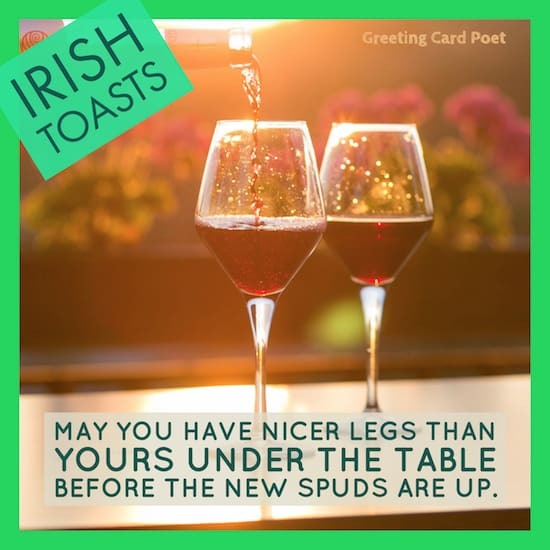 Irish toasts are short messages of kinship, good luck, honor and good cheer to share with friends and family at a pub or family home. 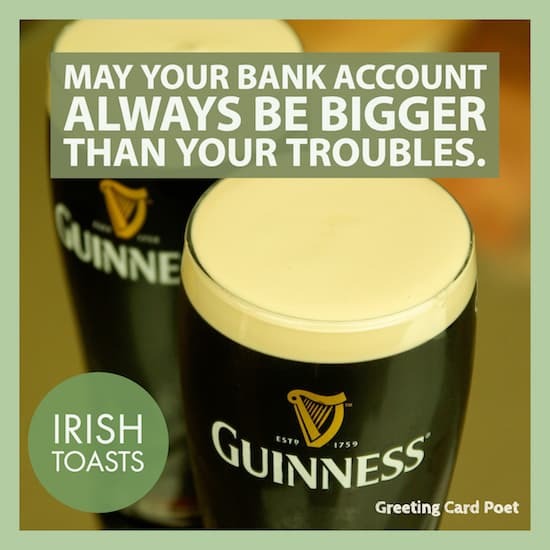 If you’re ever about to drink a Guinness or sip a Jameson with a friend, you should be ready with an Irish toast. 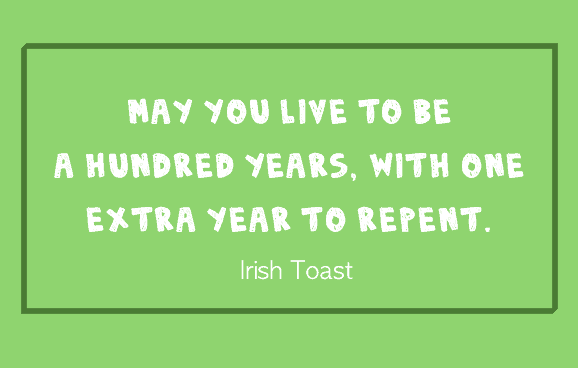 Take a look at the Irish toasts we’ve gathered, and let us know of any we’ve missed. Cheers! That the roof above us never fall in, and may we friends gathered below never fall out. Here’s to a sweetheart, a bottle, and a friend. The first beautiful, the second full, the last ever faithful. And may the strength of three be in your journey. Sláinte’. That there be a generation of children on the children of your children. Here’s that we may always have a clean shirt, a clean conscience, and a guinea in our pocket. Here’s to temperance supper, with water in glasses tall, and coffee and tea to end with — and me not there at all! May you die in bed at ninety-five years, shot by a jealous husband. Here’s that a mouse never leave your meal bag with a tear in its eye. May the good Saint Patrick protect ye, and the devil neglect ye. For the devil say a prayer for you. Combining the concept of money with a reduction in worries why you’re drinking? No wonder everyone loves this Irish toast. May you have nicer legs than yours under the table before the new spuds are up. 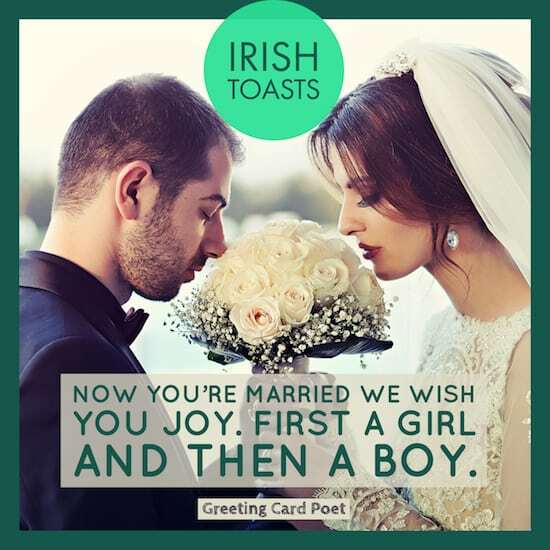 Also known as the Irish bachelor toast, but with any luck, it could lead quickly to an Irish Wedding toast. In typical Irish fashion, the point of the story can frequently be combined with a laugh or two. Try out an Irish drinking toast your next time out with the gang. Within this goblet, rich and deep, I cradle all my woes to sleep. Here’s to the eyes in your head and none in your spuds! When God measures you, may he put the tape around your big and generous heart and not around you small and foolish head. may you find that you’ve married your best friend. That misfortune follow you the rest of your life, but never catch up. And if there’s anyone in the wall, speak up! I love but one, I love not more. I’ll drink her share with all my heart. May your troubles be as few and as far apart as my Grandmother’s teeth. May your doctor never earn a dollar out of you and may your heart never give out. May the ten toes of your feet steer you clear of all misfortune, and before you’re much older, may you hear much better toasts than this. That you have the hindsight to know where you’ve been, the foresight to know where you’re going and the insight to know when you’re going too far. For you be poor in misfortune, rich in blessings, slow to make enemies, quick to make friends. But rich or poor, quick or slow, may you know nothing but happiness from this day forward. For the frost never afflict your spuds. The outside leaves of your cabbage always be free from worms. That the crow never pick your haystack, and may your donkey always be in foal. That the sound of happy music, And the lilt of Irish laughter, fill your heart with gladness, that stays forever after. That your glass be ever full. And, that the roof over your head be always strong. and may all your friends remember all the favors you are owed. thus your happiness will be nothing less. May you always have a clean shirt, a clear conscience, and enough coins in your pocket to buy a pint. If you ever have an opportunity to visit Ireland, you’ll love it. That your doctor never earn a dollar out of you and may your heart never give out. That the ten toes of your feet steer you clear of all misfortune, and before you’re much older, may you hear much better toasts than this. Now you’re married we wish you joy. First a girl and then a boy. Made in Heaven, lived on Earth. Marry carefully and love will surely follow. A toast to love and laughter and happily ever after. And here’s to the bride with groom so rare! And their misfortunes as light as the foam. May we all be alive this time in twelve months. As you were born on a lucky star, may that star never lose its twinkle. May you be seven times better off a year from now. And may your journey be smooth and happy. That time never turn your head gray. No wasps in your honey, but bees in your hive. May you live be be a hundred years with one extra year to repent. Here’s to the women that I’ve loved and all the ones I’ve kissed. As for regrets, I just have one; that’s all the ones I’ve missed. Every single thing we say, and everything we do. And may you be poor in misfortune, rich in blessings, slow to make enemies, quick to make friends. But rich or poor, quick or slow, may you know nothing but happiness from this day forward. May the frost never afflict your spuds – may the outside leaves of your cabbage always be free from worms. And, may the crow never pick your haystack, and may your donkey always be in foal. And if you fight, may you fight for a brother. Give genius a better discerning. To the ones we love dearest and most. Smile upon you St. Patrick’s Day. Tip: Some of these Irish Toasts make great photo captions around St. Patrick’s Day. Morning is the time to pity the sober; it’s the best they’ll feel all day. Here’s to absent friends and here’s twice to absent enemies. Dung hills rise and castles fall, we are all equal one and all. May your troubles be less, And your blessings be more. And nothing but happiness come through your door. Here’s to a wet night and a dry morning.